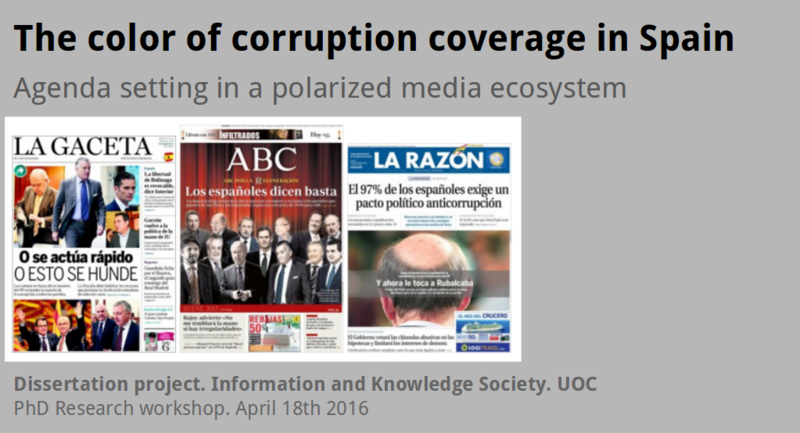 In September 2015 I started a new phase in my research about corruption coverage in Spain. I’ve joined the Information and Knowledge Society doctoral programme at the Universitat Oberta de Catalunya (UOC). The plan is to convert my research El color de la corrupción into a PhD dissertation in the following years. Last semester I took two courses on research methodologies: Advanced Qualitative Methods and Research Design in Social Sciences which lead me to draft a research proposal for my dissertation. Like I did with my architecture master thesis (Proyecto Final de Carrera in Spanish) I plan to document the entire process openly on line. For the moment I’ll use this blog you are reading at numeroteca.org. There are a lot of things to talk about: selection of the topic, new areas of research, bibliography, methodology, on line education, why in English… and what it means (and why, how) to make a PhD. I’ll start with this short presentation I prepared two weeks ago for a seminar at UOC to get some feedback about the research proposal. The following month I have to officially present the research plan. The color of corruption coverage in Spain. Agenda setting in a polarized media system. In the recent years, the fast-growing list of corruption investigations in Spain have involved almost every institution in the country: the major political parties, the royal house, the main unions, the supreme court or the national bank, just to mention some of them. Everyday, new information and a new case is released/unveiled, provoking an increasing sense of indignation. This situation has pushed up the concern for corruption to the second position of the problems perceived in Spain. to update theories about the Spanish partisan media ecosystem and understand how media outlets are reacting to the new wave of corruption scandals. to find out if (and how) corruption coverage influences public opinion in order to help readers understand how persuasive is the mass media ecosystem. In a system where people select the newspaper more aligned to their ideology: what comes first, the agenda setting and framing by mass media or the general public predisposition? 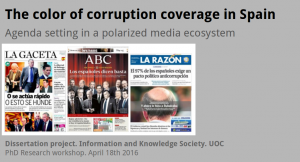 to study how is the feedback between social networking sites and mass media regarding corruption coverage and how they drive attention to certain stories? We are going to analyze corruption stories in front pages of paper newspaper and home pages of online newspapers to measure the importance given by the media to certain topics. Whereas front page analysis is not new, we propose the use of new methods (PageOneX.com and StoryTracker software) to have better and more accurate metrics that take in account size and visual aspect of the analyzed stories. We plan to complete our research using existing datasets like opinion surveys and databases of social networking sites, like Twitter. Social networking sites are another key element to analyze the influence of mass media in the public agenda and to help understand the triangle media, politics and public opinion. The thesis committee is formed by Ismael Peña (tutor), Sasha Costanza-Chock and Victor Sampedro.